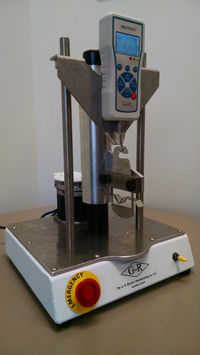 G-R Manufacturing has been producing a wide range of meat testing equipment for over 50 years. The quality and reliability of the machines have been recognized by the meat processing industry worldwide for decades. Both machines are lightweight (less than 25 lbs. 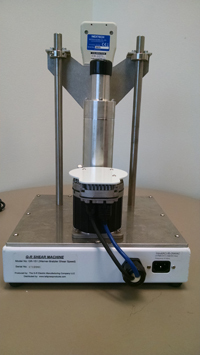 ), portable (12” x 12” x 20”) and can be set up anywhere to quickly and easily conduct sample testing. Both devices are supplied with a digital force gauge which displays readings in N, kN, kg-f, oz-f and lb-f and have an accuracy of +/- 0.2% of capacity. The device is operated with a single switch that controls the upward and downward movement of the blade and is equipped with and emergency shut-off button. The Warner-Bratzler Shear machine comes equipped with the traditional "V" style Warner-Bratzler blade and operates at a constant 225 mm/min. 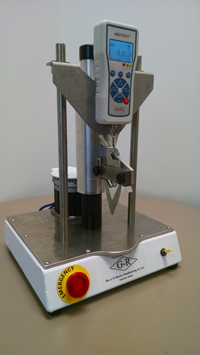 The machine is supplied with a 1/2" manual coring tool to prepare the samples for testing. The machine is equipped with rechargeable 500 newton (50 kg) digital force gauge to measure and record peak force during sample processing. The Slice Shear machine comes equipped with a rectangular shear blade measuring just over 5 cm in width to accept a slice shear sample prepared using the Slice Shear Force Kit. The Slice Shear Force Kit is not included with this machine. The machine operates at a constant 500mm/min as per the Slice Shear test protocol from the USDA. The machine is equipped with a rechargeable 500 newton (50 kg) digital force scale to measure and record peak force during sample processing. Units can be supplied with any type of power cord.